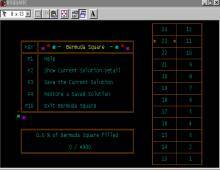 Bermuda Square is a fun little game based on a neat little mathematical equation: 1^2 + 2^2 + 3^2 + ... + 24^2 = 70^2. Your objective is to place as many squares as possible into a 70 x 70 box without any overlap. The squares range from 1x1, 2x2, 3x3 and so on up to 24x24. The more squares you can fit in, the more scores you will get. XOR even had a contest running for a while for high-scorers. Overall, a neat little mathematical brainteaser that’s worth your while... or at least as long as your coffee break lasts ;) It’s short, it’s simple, but it’s quite a nice little gem that fans of abstract puzzles should take a look.